Rosemaling not only makes it possible to give new life to old objects, but, in this instance, brings joy where once there was pain. This spindle-backed chair was built c. 1910 and used in the Mount Horeb hospital on Main Street. Although the bentwood handles look inviting, this seat was occupied by those having their tonsils removed. Ella Mavis of Mount Horeb acquired the chair after the hospital closed, and in 1970 she requested it to be rosemaled by local artist Oljanna Cunneen. Through ethnic art the chair became an instrument of warmth and hospitality. When looking at everyday objects it may be easy to forget that they have the capacity to tell a colorful history reflecting changes in ownership, function and intentionality across time and place. One of the ways through which these changes can be expressed is through the application of decoration. Decorated objects possess sensorial qualities and reflect the identity of both the artist and the owner of object. It can also work to re-write, or even challenge, the previous chapters of an object’s biography. Ella Mavis’s (1901-1991) chair is just such an example which, through the transformative potential of craft, in this case rosemaling, an object from once associated with pain becomes one of comfort, as well as from an institutional item to one of private and deeply personal value. During the first part of the 20th century, Mount Horeb’s hospital was located on Main Street and served as the initial home of this chair. This spindle backed chair was constructed in 1910, and the bentwood armrests with a tall back creates a sense of welcome and a sturdy support for long hours of sitting. Perhaps due to the inviting design one may expect to have seen it in the waiting room, but this would be a dramatically inaccurate assumption. This practical looking chair was utilized by doctors to remove tonsils. The use of household furniture to facilitate medical procedures was not an uncommon practice, particularly among rural hospitals. When the hospital closed, the next stage of this chair’s “life” would begin when it was purchased by Ella Mavis of Mount Horeb around the time she was married. Very little is known about Ella. The degree to which she claimed Norwegian decent in unknown, as is whether she was employed outside the household, or if she and her husband (whom she married at age forty) had children. Little is also known as to her reasons for bringing this chair, whose history may make many a visitor’s experience in that seat turn from relaxation to uncomfortable squirming, into her home. Perhaps she purchased the chair for this very reason – an object with a story, a story which may have involved a younger version of herself. It may have functioned as a conversation piece. The chair, too, is a highly functional piece of furniture, and this may be another factor which encouraged this purchase as she began to create a home and sense of domesticity. 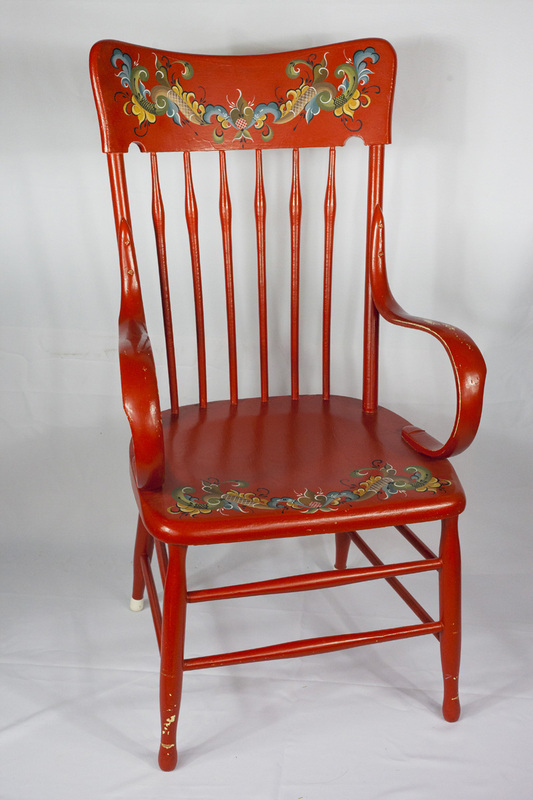 In 1970, a seventy-year old Ella commissioned local artist Oljanna Cunneen to apply rosemaling to the chair. The chair, now painted in vibrant orange, has blue and orange rosemaling motifs “draped” across the backrest with a complimentary repeat of the pattern near the front of the wooden seat. According to Pauline Garvey (2003), this chair, as a result of its low-key design, aligns with Norwegian notions of creating a “good” home. Here, a “good home” stresses the significance of comfort through the practical and functionality of objects. Through Oljanna’s rosemaling, this chair is elevated to a sense of what Norwegians refer to as koselig, which marries aesthetic qualities of home furnishings with their functionality to create a sense of comfort in the home. When we take into consideration the often complicated biography of everyday objects, we may reveal contradictory chapters within these stories. These chapters reflect not only the use of said objects, but the identity of those who owned, used, and in some cases modified their purpose and character. Through ethnic art of Oljanna Cunneen, Ella Mavis’s chair became an instrument of warmth and hospitality. Garvey, Pauline. “How to Have a ‘Good Home’: The Practical Aesthetic and Normativity in Norway.” Journal of Design History 16, no. 3 (2003): 241-51.